I love the interior of the Norwegian parliament building - it's beautiful! But I'm really hating Sonja's outfit and hat this year. If you read the first few pages of this thread, this has been addressed quite a few times. But here's an explanation for why Norway's various crown princesses have not attended the opening of Stortinget for more than 100 years. Her Majesty, are there some HQ pics of the event somewhere available like last year? 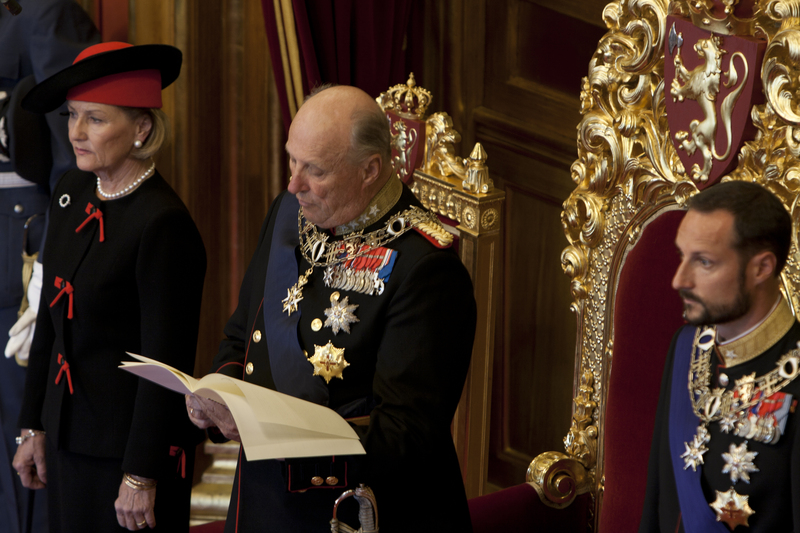 King Harald has undertaken the formal opening of the 157th session of the parliament today, October 2nd. 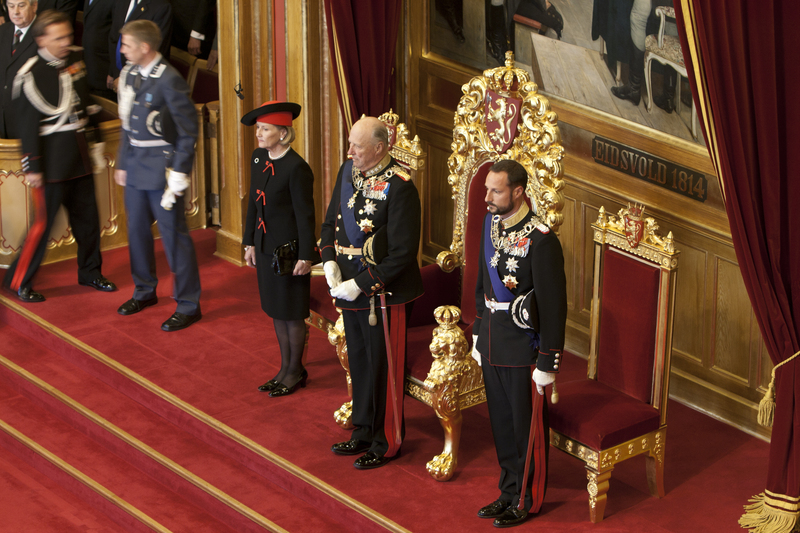 Queen Sonja and Crown Prince Haakon have been present as well. His Majesty The King will undertake the formal opening of the 158th session of the Storting. Her Majesty The Queen and His Royal Highness The Crown Prince will also be in attendance (13:00). What order is the ribbon that the King and Crown Prince are wearing? Okay, what are we looking at? What's the role of the NRF? The opening of the new session of Stortinget, this year the first efter the election, which means the King reads a speech by the goverment and their plans for Norway, but the sitting goverment wont be governing next week since we will have a change. The King opens Stortinget and reads the speech, the Queen and Crown Prince decorate the ceremony There was alot of protests when the queen wanted to attend back in the 90s becauseNorway had not had a Queen in so many years so that was something new and "untraditional". The PReisdent of Stortinget was opposed but Sonja got her way and has attended ever since. 1. When His Majesty the King is ready to be received, the President of the Storting takes his seat and declares the sitting of the Storting lawfully called to order. 2. The procession enters the Storting Chamber. The Members of the Storting remain seated. 3. The King and the royal entourage enter the Chamber. Everyone rises when they appear at the entrance to the Chamber. 4. The first verse of the Royal Anthem (Kongesangen) is sung. 5. The King reads the Speech from the Throne. 6. The King and the Members of the Storting take their seats. 8. The King and the Members of the Storting then rise and the Prime Minister presents the State of the Realm Address to the King. 9. The President comes forward and receives the Speech from the Throne and the State of the Realm Address from the King. 10. The President speaks, closing with the traditional words “May God preserve our King and country”, joined by the Members of the Storting. 11. The first verse of the National Anthem (Ja, vi elsker) is sung. 12. The King and royal entourage leave the Chamber. Everyone remains standing until the procession of senior officials has also left the Chamber. 13. The Secretary General of the Storting enters and bows to the President to indicate that the King has left the Storting premises. 14. Before the sitting is adjourned, the President recommends that the Speech from the Throne and the State of the Realm Address be submitted for deliberation at a subsequent sitting. Thank you Larzen & Fairy Tale. Nice info, pics and video. I like that the role of the monarch in Opening of Parliament is more of a British model, rather than the other Scandivanian countries. BTW why doesnt the Crown Princess attend the Opening? Is it just this year, or is it always this way? His Majesty The King will undertake the formal opening of the 159th session of the Storting. Her Majesty The Queen and His Royal Highness The Crown Prince will also be in attendance (13:00). Opening of the parliament 2014.